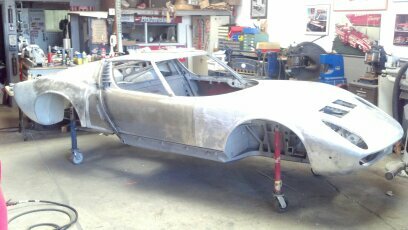 I haven’t had a chance to post much on the Lamborghini Miura because it’s been off getting specialty aluminum fabricating and fitting. Tiki Alvarez is the craftsman that handles all my specialty aluminum fabricating and TIG welding. He worked along side his father for years and when his dad passed he took over the family business. He does exceptionally good work. Tiki and I worked together in fitting the front and rear pieces to the chassis. The owner has two rear clips that required both to be fitted for easy exchange. The complete chassis and cockpit with doors were media blasted prior to getting the aluminum fabricating done. The aluminum pieces – the front and rear clips – were chemically stripped because the aluminum was very thin and we didn’t want to create any damage. I got the Miura chassis back at the shop a few weeks ago and we’ve metal prepped and rust conditioned the entire chassis and cockpit. As a precautionary measure we metal prepped everything again and baked in the spray booth for about 45 minutes at 150 degrees to get it readied for seam seal and primer.